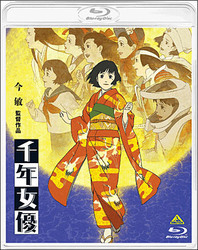 Bandai Visual announced on Tuesday that the late Satoshi Kon's 2001 film Millennium Actress is getting its first Blu-ray Disc release in Japan on February 21, 2014. The 6,090-yen (about US$61) release will be based off a telecine with a new print, HD mastering, and Panasonic's MGVC (Master Grade Video Coding). The 87-minute film will have four minutes of bonus extras: teaser and full trailers (both off new prints) and television commercials. The Blu-ray will also have the audio commentaries by Kon, sound director Masafumi Mima, and Chiyoko Fujiwara's voice actresses Miyoko Shoji, Mami Koyama, and Fumiko Orikasa (from the limited first-edition DVD Collection Box). The sound will be in Dolby TrueHD (5.1 ch) and Linear PCM (Dolby Surround). The first copies of the release will bundle a four-fold liner note with text by critic Ryusuke Hikawa.